There's an old ethiopian saying that spiderwebs joined together can catch a lion. Taytu  the name comes from a legendarily strong-willed Ethiopian empress  is a company composed of small leather and handwoven-textile producers in and around Addis Ababa. Collectively, these craftsmen are achieving what they could never have accomplished on their own: they've established the first luxury label in one of the poorest countries on earth. Barneys New York and Fred Segal in Santa Monica, Calif., are among Taytu's growing and loyal customer base. Those are some high-profile lions. Taytu taytu.com, which is endowed with long-term support from the ngos U.S. Agency for International Development and U.N. Industrial Development Organization, began five years ago with the idea that fashion buyers in developed nations would buy Ethiopian luxury products  in this case, ornate leather handbags and beautiful one-off scarves  if the goods they were being offered were sophisticated, in tune with current trends and still authentic and well made in the tradition of this ancient African civilization. Creative support came in the form of a few designers and fashion technicians, including Italians Ambrogio (Gino) Malinverni, who trained the craftsmen in their own factories and workshops, and Barbara Guarducci, a fashion consultant who has since taken the helm of a design collective in Bangladesh. Joining them is American marketing consultant Holly Hikido, who works with design consultants at brands like Missoni and Fendi. 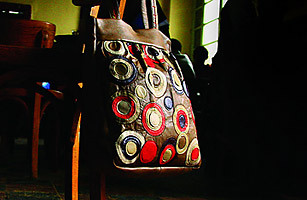 In November 2007, Taytu opened a tiny store in chaotic Addis Ababa, where handbags and scarves are displayed on old coffee-grinding tables that are set against a backdrop of hand-painted flowers. But Taytu-produced goods could turn up in ever more sophisticated surroundings. The 250 or so Ethiopians earning a living because of the company are also manufacturing small sample runs for some of fashion's top names. New York City�based brand Theory, for example, has placed an order for scarves and bags with the aim of selling them under the label Taytu for Theory at its Manhattan flagship store. Model turned humanitarian Liya Kebede, who produces her line of children's wear, Lemlem, in her native Ethiopia, also uses Taytu as one of her resources.